Is Emblema Nomenpenia, Name Tag Deficiency Syndrome (NTDS) real? “Over a half of a million people suffer every year from Emblema Nomenpenia, more commonly known as Name Tag Deficiency Syndrome (NTDS),” said Scott Ginsberg, The Name Tag Guy. The first thing to do is to check for any of the symptoms. This first thing to know is that Emblema Nomenpenia impacts everyone. You may experience localized font shrinkage, inflammation of the company logo, noticeable eye irritation due to cluttered texts, the absence of upper-chest name tag placement and mild conversational uncertainty and frustration. Other symptoms may include adhesive residue. Holes in the same spot on all of your shirts. Weird looks from other people as if they can’t see where your name tag is. Fidgeting with a lanyard to make sure your credentials are visible. And the list goes on. Second, beware of the possible side effects. Beware of sudden, severe attacks of name-forgetting. There is also a possibility of networking anxiety and unapproachable behavior. You may experience missed opportunities to make new friends or business contacts. And it may even cause feelings of annoyance due to the inability to say hello to a new member or employee whose name you can’t read because their name tag is turned backward. Other side effects of NTDS can include embarrassment from a poorly located or illegible name badge. Awkward gazes at your figure from others. And not being recognized for who you are. The last thing to do is to remain calm; you can fix this! “This debilitating condition has run rampant through the American business community for many decades, experts say, although only recently has it been classified,” explained Ginsberg. While NTDS is an entirely made-up disease, the side effects are real! So, this disease is easily treatable and completely curable. Set yourself apart from those around you and become more approachable by wearing a name tag. Many companies use name tags on a daily basis to help customers and consumers identify employees and staff. The primary usage of wearing a name tag is to provide a distinguishing feature to the wearer. It’s all about friendliness and identity. By branding and personalizing yourself with a name tag, you are helping those around you to remember who you are. So, find your solution to Emblema Nomenpenia (NTDS) at nametag.com today! We have every possible solution to this illness. 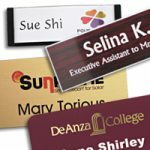 From blank name tags and name badges to customized name tags with a logo, we are your one-stop shop for all personal identification needs! I think I’m suffering from NTDS. Where is my tag? People are forgetting who I am. We are sure, Charles, that you are unforgettable. However, we are sure to have any and all of your personal identification needs. Please check out what we have to offer at http://www.nametag.com.